Anyone who imagines there is any such thing as a "free" market ideology being promoted in education by government needs to look at its current plans for schools. There never has been anything free about the market. It's about capitalism pushing through its agenda, exercising its power. At present it is doing that courtesy of the Labour government in a most brutal fashion, and it is meeting minimal opposition either from within its own party ranks or from workers. For education, education, education read profits, profits, profits. Take a look at the academy and trust schools programme. This is presented as being about "choice and diversity of provision" to raise educational standards. Actually, there will be no choice about it – and there is no evidence that it improves standards either. In 1986 Kenneth Baker, the Tory education secretary, announced a radical new City Technology College programme for schools. Any private or religious sponsor with a spare £2 million would be able to own a state school. Government would pay the rest of the start-up costs – at that time about £10 million – to open the new school, and in addition cough up the running costs and subsequent capital costs. In return for the £2 million, sponsors would be allowed to name the CTC after themselves and control what was taught. There was outrage from the Labour opposition, particularly Jack Straw. Later, the programme was quietly dropped. The target of 30 CTCs was never reached. Not enough profits in schools for big companies, even when you only have to spend £2 million. In fact Straw pointed out in 1990 that the only sponsors Baker could scrape together were "second-order companies whose directors were interested in political leverage or honours". Private education promoter and businessman Cyril Taylor was appointed as Chairman of the CTC Trust. As Sir Cyril Taylor he resigned from the Tory Party in 1997 when Blunkett appointed him government adviser on specialist schools. He has now acted as adviser to 10 successive education secretaries. When Straw's government came to power in 1997 it proceeded to put every one of Baker's education policies into practice. Now we have the academies programme, with a target of 200 by 2010. Spot the difference. Sponsors still have to pay £2 million to sponsor an academy, although it currently costs around £25 million to build a new school. It was recently revealed that quite a few sponsors haven't actually handed even this paltry sum over yet in spite of the fact that they now effectively own an academy, appoint its governors, hire staff, dictate pay and conditions, and determine the curriculum. A National Audit Office report recently found that just two academies have cost more than £101 million to run, over three times the original estimate. Bexley Business Academy, whose sponsor is "cash for honours" scandal-mired Sir David Garrard, has cost £58.2 million to run, and it is still failing. The Unity City Academy in Middlesbrough, infamous for teaching creationism in science lessons, sponsored by evangelist Sir Peter Vardy, has cost £43.6 million. It also is still failing. Local education authorities have no say or powers over academies, although they are run using public money. Government claims that this programme is about improving "failing" schools have been exposed as a sham. Many of the schools forced into the programme have been shown to have been highly successful at the time of closure. So we the taxpayers supply the funds, and the "sponsor" spends it as it wishes. And our money is being poured into this scheme – you only need to visit a new academy and compare it to a secondary school down the road to see the contrast in funding. When government claims a big increase in public spending on education it is true, with a great deal of it pouring straight into these state-sponsored, effectively private schools. They are called "independent, non-fee paying schools". Actually, we are all paying the fees. The new Schools Commissioner will "promote and support the development of Trust schools . . . and Academies, by identifying suitable partners and sponsors, and by facilitating the matching up of these with schools. He will also work with local authorities to develop their capacity in their new role as strategic commissioners of school places, and to ensure that their duties to promote parental choice, greater diversity and fair access are fulfilled, both when commissioning school places and when planning for major capital investment in their school estate. And he will be responsible for working strategically with a small number of high priority local authorities in discussions about reorganisation, and more widely advise on solutions to improve standards in failing and the lowest attaining schools." It is not surprising that there has been a massive growth in private companies out of providing "educational services" to all schools, not just academies – profits that come directly from public money. Between 1995 and 2004 there was an 850 per cent rise in management consultancy fees from the public sector in general. Schools already spend £120 million more on exam fees charged by the private exam boards than they do on books, and those fees are set to rise by 11 per cent this year. Normal financial regulations that govern council and state school spending don't apply in academies. If the sponsor wants to spend the school's money on buying goods and services from its own company, via its control of the governors, that's fine. Unsurprisingly, it often does. Born-again Christian Sir Peter Vardy's academy schools paid £111,554 to his second-hand car dealership Reg Vardy plc for "support services such as marketing and recruitment". They also handed over £14,039 to the Billy Graham Evangelistic Association to pay for Vardy's brother's time on academy business. No tendering or Best Value process necessary. Arm-twisting still goes on. Sponsors are now offered a "four academies for the price of three" deal. In April this year, head teacher Des Smith, one of Sir Cyril Taylor's team at the Specialist Schools and Academies Trust, was arrested and questioned after an undercover reporter recorded him apparently offering a peerage in return for academy sponsorship. Arrests over the subsequent "cash for honours" investigation have now included Blair adviser Lord Levy. 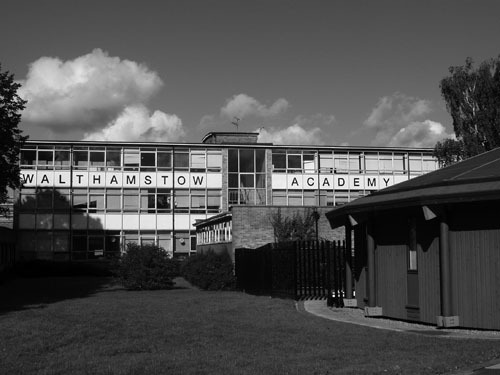 Two steps to heaven: first the government took control of education out of the hands of Waltham Forest council – then control of McEntee School was transferred to the United Learning Trust to run the renamed Walthamstow Academy. The United Learning Trust is run by the United Church Schools Trust, which is now involved in 11 academies in England. But for Blair et al this is still not enough. Only 46 academies have opened, and the target of 200 academies won't be met unless new, tougher rules push through the policy. Not enough schools have been closed and turned into academies, and many councils have managed to fend off the development of academies for local children. So forget choice and diversity, government is now to force its programme through. Under new education legislation due to become law, "underperforming" schools will be taken over as part of a trust by schools which are members of Sir Cyril Taylor's Specialist Schools and Academies Trust (their head teachers are apparently all for it). The definition of underperformance has now been widened to include both "failing" and "the lowest attaining schools". Government guidance on "Schools Causing Concern" currently out for consultation makes it clear that new School Improvement Partners (who will replace local authority employed advisory services and be directly employed by the DfES) will be empowered to make recommendations about whether a school is underperforming. If this happens, or a school fails Ofsted, and it does not make sufficient improvements after 12 months, the local authority will have 10 days to draw up an action plan, but there will be "a strong presumption...that the schools should be replaced" and become academies/trust schools. Councils will provide the money for schools but will no longer provide education. Instead they will become "commissioners" of education. In fact, the term "local education authority" has been quietly dropped in government publications. A government enforcer, called the Schools Commissioner, has been appointed at the DfES (see box above) to do the government's dirty work. Obviously we should not rely on MPs to safeguard schools – they won't do it and anyhow the new legislation has been approved by parliament. It is in the schools themselves that our power lies. Tony Blair chose "Trust School Pathfinder" Quintin Kynaston School in Westminster to make an announcement about Trusts in October. He was met at the gates by crowds of students from the school shouting and waving placards opposing the move (and the Iraq war). Teachers, governors, parents and students will need to organise together to make an even bigger noise. The NUT is campaigning vigorously against the academies. And unlike the government, the union takes research seriously and is basing its campaigning activities on the work carried out by NUT members Dr Richard Hatcher and Professor Ken Jones in two neighbouring boroughs in London to investigate how the campaigning can be done most effectively. An example of an effective campaign can be found at www.cadpag.pwp.blueyonder.co.uk.